General membership meetings are held on the 2nd Monday of each month at 7:30pm in Pittsford. A program is scheduled for each meeting on a dog-related topic of interest which may include speakers, films or demonstrations. We are also discuss proposals and changes sponsored by the AKC. Refreshments are provided and the atmosphere creates opportunities to meet other dog enthusiasts experienced in showing and breeding. Members are always willing to share their interest and expertise in dogs, and welcome fellow lovers. Our organization is always willing to welcome new members into the club. 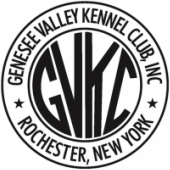 We are an AKC member all-breed club formed to promote pure breed dogs in the Monroe County, New York area. Members do not have to be actively involved in showing or breeding pure bred dogs, although many of our members do just that. Anyone interested in public education and pure bred dog promotion is welcome to attend our general membership meetings and become involved as a full club member. The first step in the membership process is to submit a Prospective Membership Application to the Membership Committee along with a $5.00 non-refundable (but applicable to full membership dues) fee. After submission of the application, the applicant must attend 3 general membership meetings within a 6-month period of time. During those meetings, information about the applicant is read into the minutes of the meeting and published in the GVKC newsletter. After completion of attendance to the first 2 general membership meetings, the applicant can submit a Membership Application to the Membership Committee which shows the intent to become a full member. Along with the application, the applicant is to submit dues (less the $5.00 from the Prospective Membership Application) for the current year, a sponsorship form with the name of at least two GVKC members in good standing and a signed copy of the GVKC Code of Ethics. At the third general membership meeting and upon completion and submission of the Membership Application forms, the applicant's application can be voted on by the GVKC membership. Voting for membership is by secret ballot. The applicant becomes a full member with an affirmative vote from 3/4 of the GVKC members who are in attendance. GVKC members voting must also be in good standing with the club. Between the time a Prospective Membership Application is received and a vote for membership is taken, a prospective member is encouraged to become involved in activities being conducted by GVKC. Helping at matches, clinics, handling or other classes, shows, and other special events is always welcome and helps show to the existing club members the willingness of the applicant to participate in club events.After full membership is achieved, members are encouraged to attend general membership meetings, become involved on various committees, help with club events, etc., but the only requirement for continued membership in good standing is the timely payment of yearly dues.